Longacre Village is an age-restricted community comprised of single-family and attached homes. Located in Dover but nestled in the woods, this neighborhood is within minutes to medical facilities, parks and recreation, as well as restaurants and shopping. Residents can even walk to the Kent County Library and a variety of restaurants. Philadelphia, New York City and the beaches are all within easy driving distance from Longacre Village in Dover. Scenic ponds with fountains dot the landscape and safe, streetlight-lined roads with sidewalks wind their way throughout this community. Buyers can choose from a variety of great homesites including scenic wooded and pond view lots. These energy efficient, high performance homes sit on lots ranging in size from 1/5 to 1/4 acre. Residents of Longacre Village at Dover are friendly and like to plan and organize their own special community events. 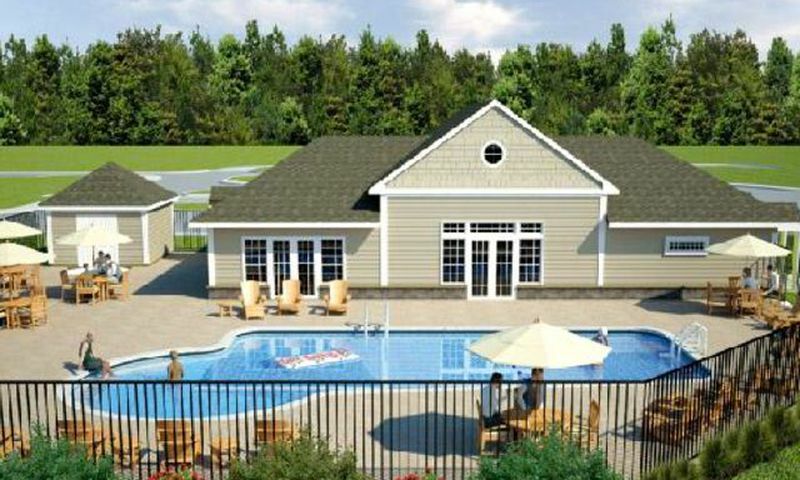 The 3,000 square-foot clubhouse is the favorite meeting place for Longacre Village residents. It not only offers a resort-style outdoor pool with patio and grilling area, but also a bar/lounge and social area. Two hobby rooms make for the ideal place for residents to meet for their card games, group meetings, and other planned activities. A fitness room, where residents have full use of up-to-date cardiovascular and strength training equipment, is also part of the clubhouse amenities. Construction of Longacre Village began in 2006 and continues today. The community is home to approximately 250 residences. Buyers have the advantage of choosing from a variety of floor plans that include detached single-family homes and attached villas. Regardless of the style, all homes at Longacre Village offer easy first-floor living and some have optional second floor lofts and bonus rooms. Living spaces cover from 1,200 to under 3,000 square feet. Most single-family residences will be built by K. Hovnanian, a leader in active adult communities. Homes in Longacre Village have between two to three bedrooms and two to three bathrooms. Some of the charming single-family homes feature covered front porches, crawl spaces and slabs (depending on the lots), as well as a long list of energy-saving features. Attached villas by K. Hovnanian come in two models that are 1,233 and 1,323 square feet with two bedrooms and two bathrooms. Builders throughout the years have constructed custom homes that are available on a resale basis. Homes Longacre Village offer luxurious baths, updated kitchens, and plenty of desirable exterior and interior features. Some of these include contemporary light fixtures, decorative crown molding, 9' ceilings, garage door openers with remotes, garage doors with windows, concrete walkways, and low to no-maintenance exteriors. Grass cutting, snow removal, and trash removal are included in the monthly association dues. Longacre Village is in a private, rural setting only minutes from the heart of Dover. It is also one of the best values in a 55+ community that buyers can get in the area. Residents enjoy tax-free shopping and comfortable living in low maintenance, quality housing with easy access to all Dover has to offer. Moving into Longacre Village is a pleasant experience with welcoming neighbors. The current residents are pro-active and like to plan fun activities and events. Newcomers are not only encouraged to participate, but to take charge as well. Residents also enjoy a distinct climate that experiences all the seasons. Longacre Village in Dover is located off Route 13 with easy access to Route 1 and Route 113. The surrounding areas offer plenty of shopping and dining venues as wells as parks and recreation. Some of the popular attractions in Dover are the Delaware State House, the Johnson Victrola Museum, the Rose Valley School Road Greenhouse, the Kent County Theater Guild, and the Schwartz Center for the Arts. Nature lovers can enjoy strolls along the beautiful beaches in the area. Check back soon for more information on the lifestyle in Longacre Village. There are two attached home models that have between 1,233 and 1,323 square feet of living space. Attached villa homes include two bedrooms, two bathrooms, and an attached two-car garage. Homebuyers can select a single-family home that ranges from 1,200 to 2,420 square feet in size. Most single-family homes have two to three bedrooms, two to three bathrooms, and an attached two-car garage. The Cottonwood and Charleston models are no longer available as new construction and there are also many custom-built resale options. Longacre Village is a great value. The homes are nice and the HOA fees are not that bad. For everything you get the homes are priced appropriately. All the lawn care and snow removal is taken care of so you don't need to worry about those costs either. We enjoy the neighborhood and like our neighbors too. 55places.com is not affiliated with the developer(s) or homeowners association of Longacre Village. The information you submit is distributed to a 55places.com Partner Agent, who is a licensed real estate agent. The information regarding Longacre Village has not been verified or approved by the developer or homeowners association. Please verify all information prior to purchasing. 55places.com is not responsible for any errors regarding the information displayed on this website.